Dedicated to my father George Everett Shaw for his 70th birthday. Sometime around 900 CE the inhabitants of the Mimbres River Valley in present-day New Mexico broke from the traditions of the Mogollon culture of their surrounding area, evolving a unique belief system which is reflected in the radically innovative painted ceramics they produced. For two-and-a-half centuries, the Mimbres people flourished as an independently governed and autonomous society engaged in trade routes that extended from Mesoamerica to Mesa Verde. By 1200 CE, they had disappeared, abandoning their homeland and dissolving into nearby cultures, most likely due to extreme drought and climate change. Caches of Mimbres pottery were rediscovered and excavated by amateur and professional archaeologists in the late 19th and early 20th Centuries. 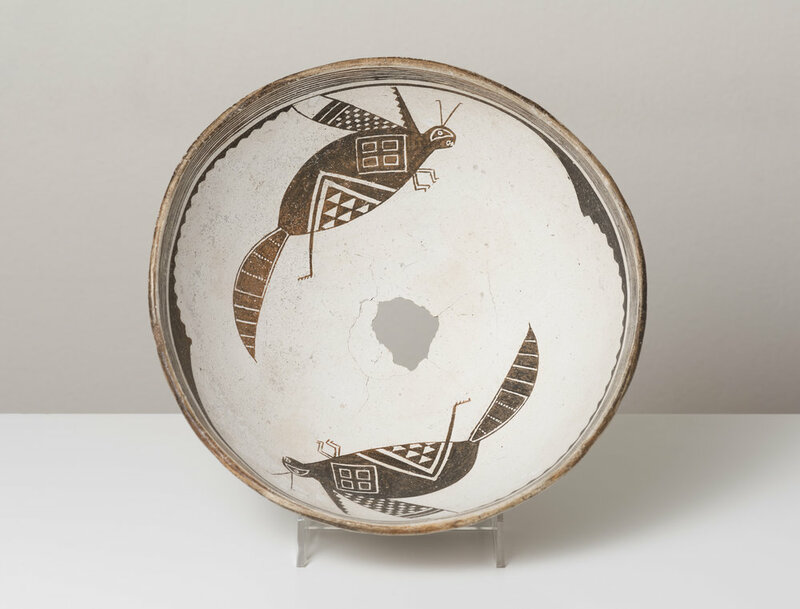 Today, Mimbres ceramics can be found in the collections of museums across the world. In the 1970s, Shields was celebrated for works which blurred the distinction between painting and sculpture. The influential Gridworks were constructed from lushly stained and painted strips of canvas woven and stitched together into large grids which were suspended freely in space, to be experienced in the round. This aspect of viewer-engagement is essential to Shields’ artwork, presenting the art object as a tool for bringing the beholder more deeply into the present moment through visual and spatial interaction. When experiencing a gridwork, the viewer is struck by how the work permeates life, integrating into the environment; she not only sees the object in space, she sees space through the object. During this time Shields also began experimenting with printmaking and papermaking techniques, which proved to be an equally fertile and inventive branch of his practice. In 1971, he created Sun Moon Title Page, an experimental work in paper which defied the traditional expectations of a print edition. Sun Moon Title Page is double-sided, the recto and verso offering complimentary experiences, like the two sides of a record. Across the edition of 100, no two are the same: the ground layer is stained by hand, creating variance in pattern and saturation. Furthermore, the surface is interrupted by a series of slits, through which strips of printed paper were woven in chance configurations by his assistants. These openings give Sun Moon Title Page a dimensionality which transcends the usual print. Through the rest of the decade Shields would explore the dimensional possibilities of perforated surfaces, delving deeply into the material capabilities of handmade paper. Alan Shields sewing together "Equatorial Route," from "The Raggedy Circumnavigation Series"
The Raggedy Circumnavigation Series can truly be considered a form of “climax ware,” a term coined in JJ Brody’s text Mimbres Painted Pottery to describe artwork “on which a certain set of visual ideals and values is pushed to its ultimate limits.” In fact, there are a number of particular affinities between The Raggedy Circumnavigation Series and the images found in Mimbres pottery. In much the same way that the Mimbres painters utilized a sophisticated geometric iconography to describe a cosmological orientation, The Raggedy Circumnavigation Series constitutes a metaphysical roadmap, in which notions of migration, interdimensionality and interconnectedness are expressed by densely layered grids, webs, and concentric circles. The compositions of both Mimbres painting and The Raggedy Circumnavigation Series display a visceral quality of movement - images appear to morph, spin and pulsate. Additionally, both seem to simultaneously depict a microscopic and macroscopic scale, a hallmark characteristic of elevated abstraction. Unlike Mimbres pottery, which is executed almost exclusively in a monochrome palette representative of the colorless Underworld, The Raggedy Circumnavigation Series is unmistakably alive, blooming in vivid color. This is not to say that Mimbres pottery is morbid or somber, although their culture has often been described sensationally as a “death cult.” In actuality, less than 40% of Mimbres painted pottery was recovered from a mortuary context, and many painted vessels bear markings from utilitarian usage by the living. Barbara Moulard explains, “While the vessels functioned as food, water, or ceremonial containers in daily life, the imagery on the vessels would have been a constant reminder of the spiritual realm.” In this way both Mimbres pottery and Shields’ paper constructions demonstrate art’s potential as a spiritual technology, offering the viewer access to “sacred time,” which, according to Eliade, “appears under the paradoxical aspect of a circular time, reversible and recoverable, a sort of eternal mythical present.” Hence, the rupture of plane truly describes a psychological barrier that exists between the “eternal present” and the profane present. This exhibition contends that artwork remains one of the primary links between humanity and hierophany, dissolving boundaries and offering access to the sacred, even in a desacralised world. Alan Shields (1944, Herington, KS – Shelter Island, NY, 2005) has been exhibited widely nationally and internationally and is included in the collections of Metropolitan Museum of Art, New York, NY; Museum of Modern Art, New York, NY; National Gallery of Art, Washington, D.C.; Corcoran Gallery of Art, Washington, D.C.; The Solomon R. Guggenheim Museum, New York, NY; Tate Collection, London, UK; Walker Art Center, Minneapolis, MN; and the Whitney Museum of American Art, New York, NY. Selected museum exhibitions include: "Experiments in Form: Sam Gilliam, Alan Shields, Frank Stella," Block Museum of Art, Northwestern University, Evanston, IL (2018); "Alan Shields: Protracted Simplicity (1966-1985)," Aspen Art Museum, Aspen, CO (2016); "Alan Shields: In Motion," Parrish Art Museum, Water Mill, NY (2015); "Into the Maze," SITE Santa Fe, NM (2014); "Stirring Up the Waters," Parrish Art Museum, Southampton, NY (2007); "Alan Shields: A Survey," The Beach Museum of Art, Kansas State University, Manhattan, KS (1999); "Alan Shields: Print Retrospective," Cleveland Center for Contemporary Art, IL (1986); "1968 – 1983: The Work of Alan Shields," Memphis Brooks Museum of Art, Memphis, TN (1983), traveled to Lowe Art Museum, Coral Gables, FL and Nelson-Atkins Museum of Art, Kansas City, MO; and "Alan Shields: Paintings and Prints," Williams College Museum of Art, Williamstown, MA (1981).